This interactive, DIY, natural, modular toy will delight a creative mind! Simple, modern, organic fun. 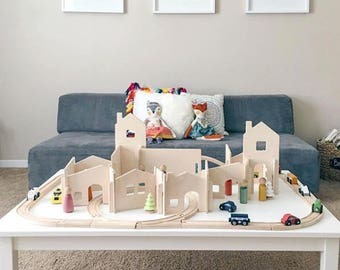 Your child can build a different world each day with this wood build-it-yourself set, then take pieces apart and store them flat on a shelf. This combines two of our most popular sets. The Treehouse is great for vertical building and the Walls are made for horizontal building: your choice between Castle, Forest, or House Walls. (Castle Walls are pictured.) When you check out, you'll be able to choose which horizontal wall set you'd like. Holiday promotion: Comes with 4 peg people, see last pic! ▧ No Added Urea Formaldehyde and CARB II compliant. **While sturdy, this toy is not intended to be used as furniture. Young children will need help in assembling this toy, as it has large pieces. 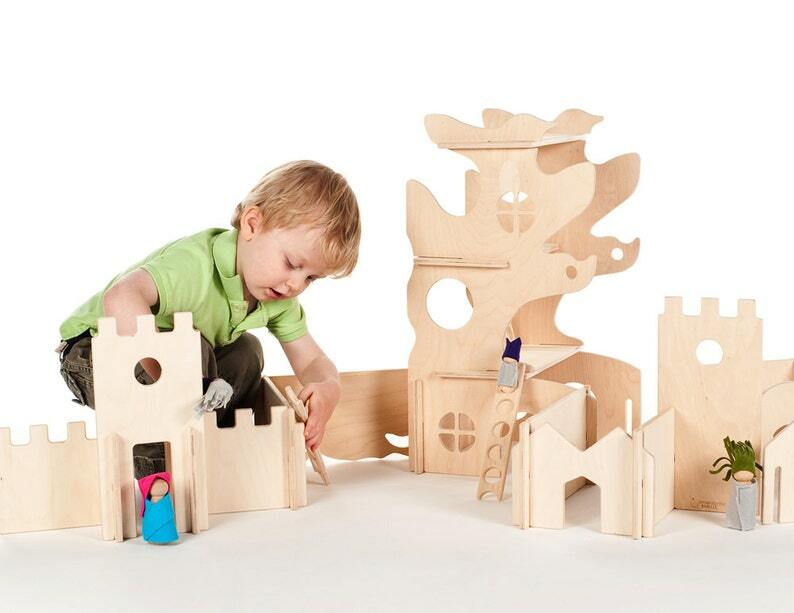 Beautiful craftsmanship and design draws kids and their grownups into new worlds! Creates a play space that invites all the other toys to come play too. Our child will have years of fun and adventure with this caringly made playset! Excellent, prompt customer service and shipping. Thank you so much! THIS TOY IS AMAZING. Hours of fun for all of my kids. So creative and open-ended. Love it!!! Very nicely made. kids love it and is beautiful in person.